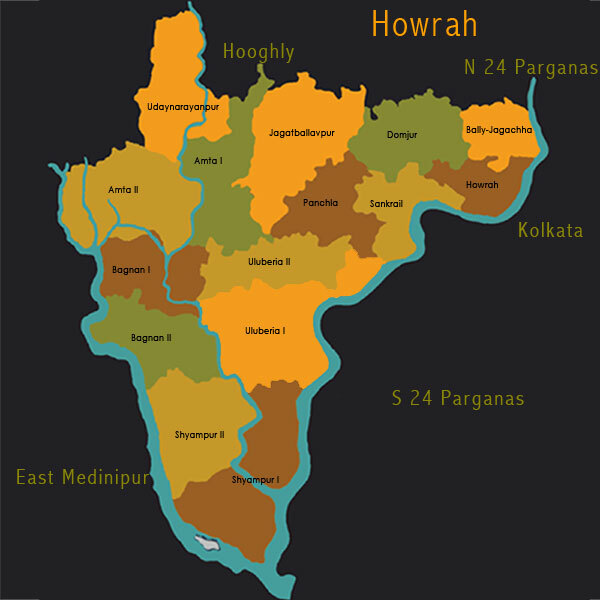 The smallest district in West Bengal, Howrah (Haora) is bounded by the Hooghly (Bhagirathi) River on the east, separating it from Kolkata and the districts of North and South 24 Parganas; on the north and north-west by the Hooghly district; on the south and south-west by East Medinipur district ; and on the west by the West Medinipur district.The Rupnarayan river too forms a natural boundary all along the district’s western border. Hemmed in by these two rivers on the east and west and intersected by the Damodar, the district is mainly a flat alluvial plain. Howrah city, headquarters of the district, is the second largest city in West Bengal and much older than the city of Kolkata (Calcutta). Located on the west bank of the Hoogly River, it is a twin city to Kolkata. The history of Howrah prior to the advent of European traders is practically unknown. It probably formed part of the Tamralipti kingdom until the decline of that kingdom around the middle of the 7th century CE, before passing on to the Rarh kings Venetian explorer Ceasare Federici was the first European to mention a place called Bator in his journal in 1578 AD which has been identified as Betor, a major trading centre around present day Shibpur. From this account it was clear that the place was a rendezvous for trading ships unable to proceed higher up the shallow reaches of the Hooghly river.This trade originally monopolized by the Portugese gradually attracted the Dutch, the English and the French. As trade expanded, it led to an extension of cultivation and to the settlement of weavers and other artisans along the river banks. The growing trade also attracted Arakanese and half caste Portugese pirates. In December 1686, the rupture with the Mughal viceroy, Shaista Khan, led to the British under Job Charnock, fleeing from Hooghly. The Mughals subsequently allowed the British to settle on a tract of land near Uluberia and Charnock recommended to his superiors that this be made the British headquarters. New villages sprung up, docks were started and villas and garden were built in Howrah city. A few years after the accession of Farruksiyar to the throne of Delhi in 1713, the British senta deputation to him praying for a settlement of additional villages,five on the west and thirty-three on the east of the Hooghly. Included in the list were the villages of Salica (Salkia), Harirah (Howrah), Cassundeah (Kasundia), Ramkrishnopoor (Ramkrishnapur), and Battar (Betor). Barring these five Howrah villages, the deputation succeeded in getting the talukdari of the remaining thirty-three. The region that now constitutes Howrah, for the next few decades underwent a series of upheavals. Several parts of it were included in the zamindari of the Bardhaman Raj under the Mughal era rulers, the Nawabs of Bengal;only to be overrun by the Marathas along with other vast tracts of Bengal, when the marauders swept into Bengal. Amid the chaos, the land also suffered the incursions of dacoits. The victory at Plassey in 1757 eventually made the British virtual masters of Bengal. The districts of Bardhaman (Burdwan), Medinipur (Midnapore) and Chittagong were handed over to the British by Nawab Mir Kasim. Howrah being a part of Bardhaman thus became British territory. By 1795 however, most of Howrah was made over to Hooghly district and the judiciary detached from Bardhaman, while Howrah city formed a part of Calcutta. The first dockyard was opened in Salkia in 1796. With the city of Howrah growing steadily in importance, a separate judiciary was set up for the city and its surrounds only for it to be brought back into Hooghly’s judicial fold in 1843. Many aspects of administrative control however were handed over to Howrah district the same year. Judicial control of Howrah district remained with Hooghly district till 1938. Howrah has historically been a district with more industrial enterprises than agriculture. Today it is a highly congested industrial belt with complex infrastructural and other problems. According to the 2011 census Howrah district has a population of 4,850,029. The urban population is almost double of the rural population at 63.38%. By the middle of the 19th century CE, Howrah had become the nucleus of industrialization in India. Thus the chief reason for the surging population from the nineteenth century onwards was the industrial activity in the metropolis of Calcutta, in Howrah city and along the river bank. 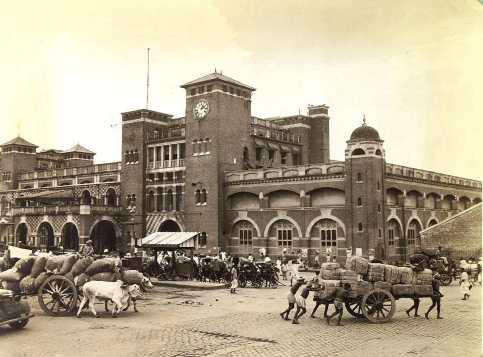 The opening of the Howrah Railway Terminus (the terminus of the first Indian Railway system – the East Indian Railways) in 1854, the dockyards, the numerous flour and jute mills and other factories attracted large numbers of labourers as well as professionals from Bihar, Orissa, Uttar Pradesh andother States, while traders, especially from the Marwari community also made Howrah their home. By 1908, there were no less than 56 factories in the district. The industrial boom continued through World War II and brought with it rapid, albeit unplanned urbanization. After the partition of India, the jute industry went into decline with the larger production areas handed over to East Pakistan (Bangladesh).Today, Howrah is better known as an engineering hub. Horticultural activities too are picking up in the district while fishing too is an important industry. With the accent on industrialization, village handicrafts were of little importance in the district but weaving was once an important industry till heavy duties levied on it and the import of machine made piece goods in the early 19th century dealt it a fatal blow. Silk rearing and spinning to was once important. Pottery and painted earthenware comprising toys, masks, imitation fruits of Dumjor and Uluberia were well known locally. The women of some Muslim communities embroidered handkerchiefs and fine muslin cloth with Chikon work – a craft that continues to have a niche demand till date. The Dom community continues to turn out excellent cane work and basketry. The horn crafts of Howrah, in the face of competition from cheap plastic and expensive raw material, goods are on the verge of extinction. 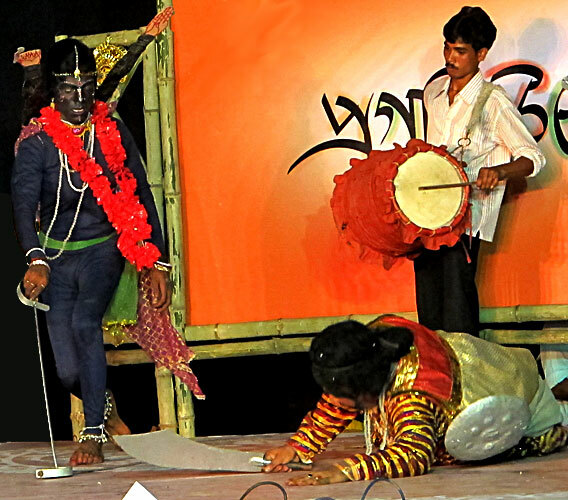 In the arena of performing folk culture, Kalika Patari, a dance based on stories of Kali from folklore and the Puranas still survives, though probably in an altered form, in some areas. Probably because its rivers changed course so much, there is hardly any evidence of ancient relics in Howrah district. The oldest temple, the Kalyaneshwar temple at Bally, devoted to Shiva, belongs to the 17th century. Once known as the ‘Manchester of Bengal’, this district has a number of places of tourist interest, all located in and around the Howrah Municipal Corporation. These include the Howrah Bridge (Rabindra Setu) built in 1943 (replacing the older pontoon bridge of 1874) connecting Howrah city with Kolkata; the Botanical Garden established in 1786 and the Belur Math and temple founded in 1897 by Swami Vivekananda.